If it's not fun you're doing it wrong. This is what I aspire to as a crocheter. This is one of the many beauties that can be found in the 'Museum of Useless Objects' over at Etsy. 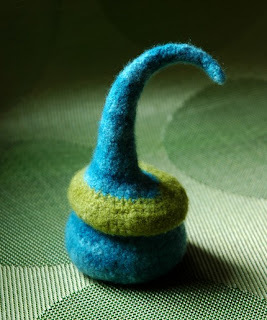 I've loved Sarah's crocheted felted creations for awhile now. Be sure and check out all her other great stuff. If Smurfs reproduced via acorn, that's what it would look like. Totally cool. I live in Austin, Texas, with my teenage son and a neurotic (but sweet) beagle. My son is also sweet, by the way.